Anyone who knows me will know how much I love anything magical and I love bringing magic to life for the kids, no matter what age you are, you can still believe and even if you don’t, I will try to convince you that magic is there. One of my favourite parenting moments is having a fairy door and all the fun you can have with it. So, when I came across The Fairy Trading Company, I knew we needed this in our lives. 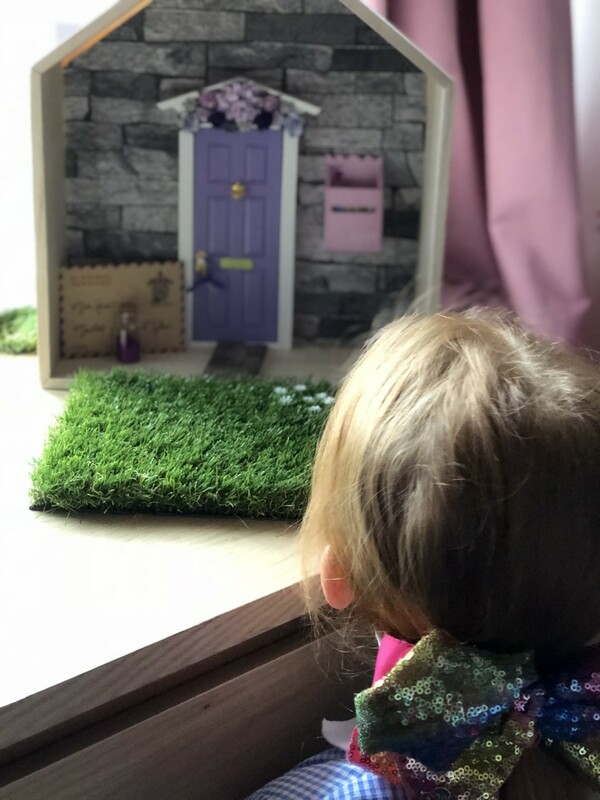 When you order the door, it is delivered quickly and comes in a gorgeous box, with a handwritten personalised envelope, a magic key, postcard and is all wrapped up in gorgeous sparkly tissue paper. We also ordered the post box, it’s a great addition to it for little notes. 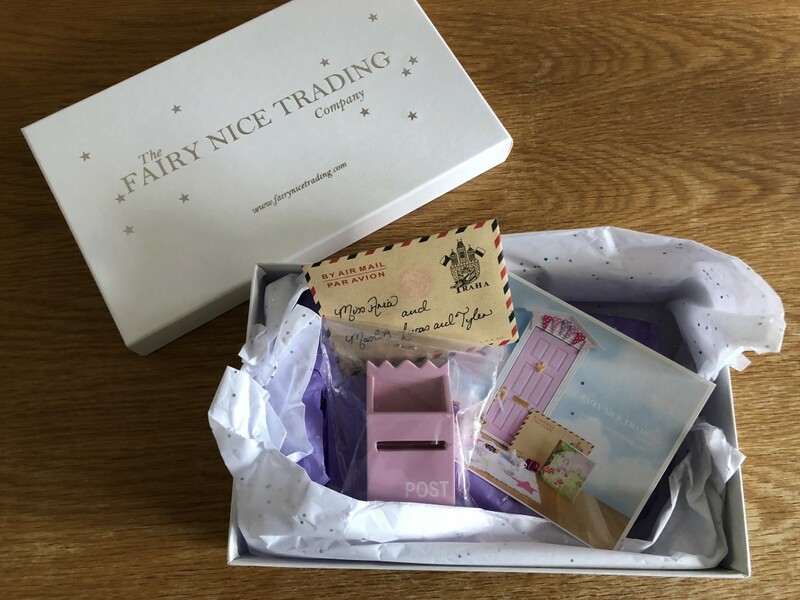 The Fairy Nice Trading Company go above and beyond to make this delivery special. 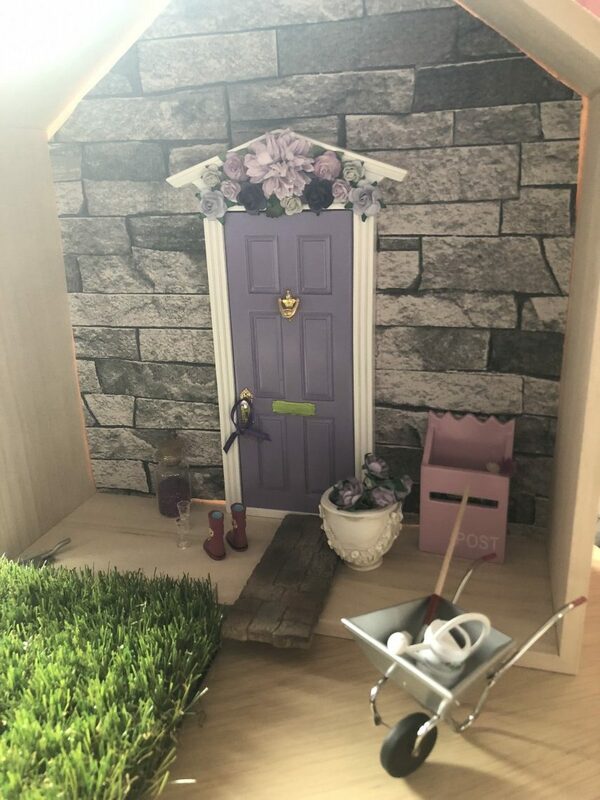 We chose the most stunning purple fairy door with flowers along the top of the door. It is gorgeous. The attention to detail is exquisite and it is just lovely. I think it’s perfect. I’ve had this for months now and still love it. 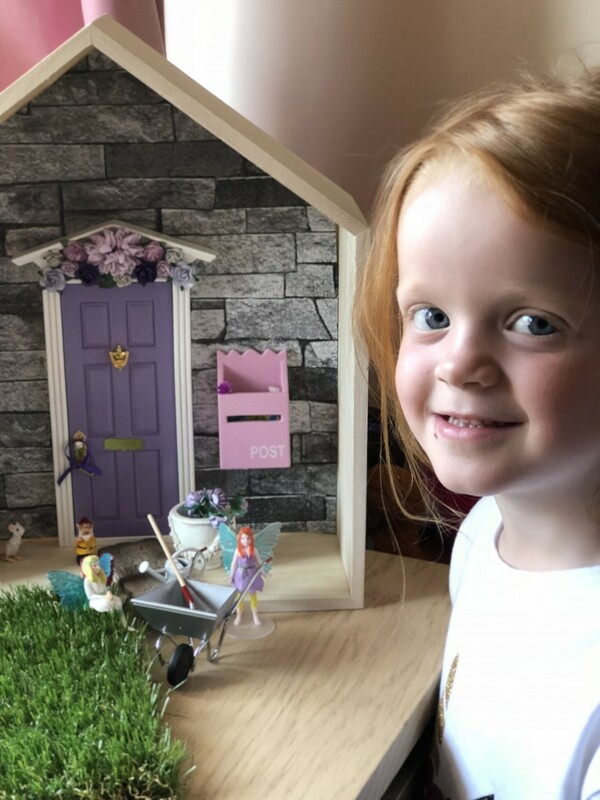 The Fairy Nice Trading Company has lots of advice on its website about how you can introduce the door to your family and where to place it. 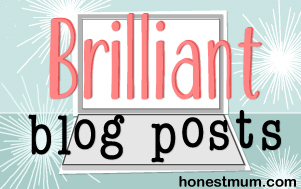 There are loads of ideas. I decided to go with a little house shaped shelf to display the door. This would allow for a bit more scope on how I was going to use it and what to display on it. 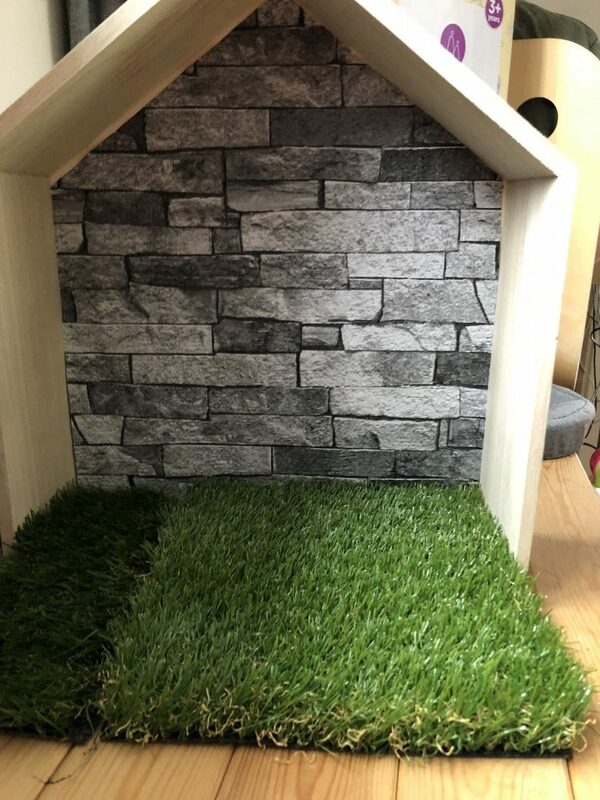 I bought the shelf from eBay, along with some fake grass and some wallpaper samples. I glued the wallpaper on and even bought a little path. I added on a few accessories too. Doesn’t it look amazing? I loved setting this up and was so excited to see what Aria thought in the morning. As I’ve said the details are wonderful, right down to the little crystal doorknob that you can add the key on. It is required for the fairies to get in and out. The little knocker moves too, it’s so cute. Aria was completely enchanted and couldn’t wait to go to bed every evening to see if the fairies would bring her a note or get up to something magical. The Fairy Nice Trading Company also does little accessory kits. There are so many to chose from, we chose the gardening one this time, but there are one for birthdays, picnics, Christmas, etc. 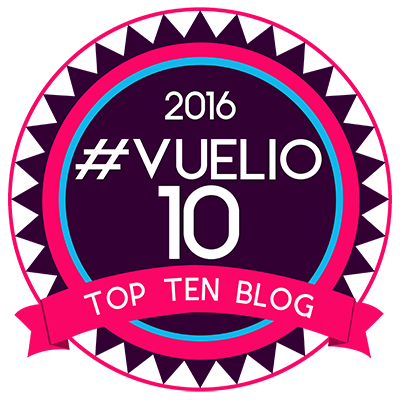 You have to head over to the website to have a look, you’ll love them all. 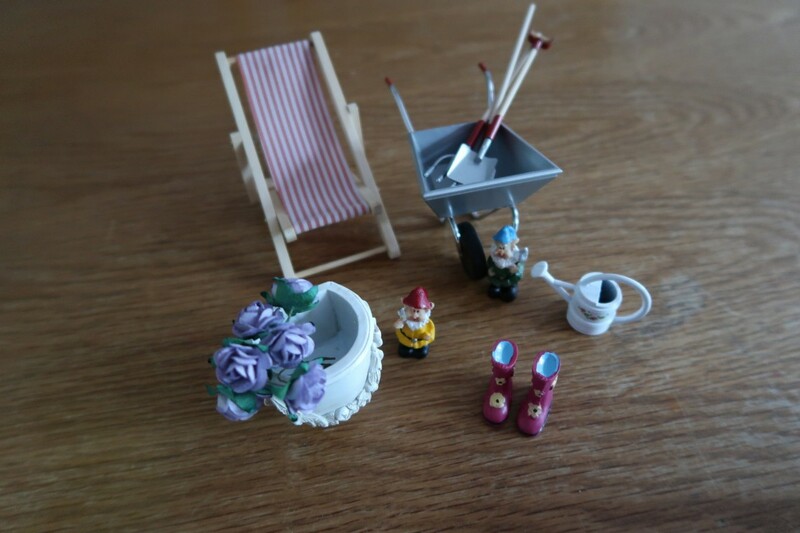 This kit comes with flowers, deck chair, cute little gnomes, wellies, plant pot, watering can and tools for you to create your own little scene. We got a free wheelbarrow, which was the offer at the time. There are different offers on frequently so it would be a good idea to sign up for their newsletter. You can have it moving around and your fairy doing different things each night. We’ve had her planting chocolate flowers, to the gnomes playing tricks. There is so much you can do and so much fun. It’s like being a child again. Aria was delighted with the fairies and loves seeing them and what they get up to on their little adventures. The Fairy Trading Company has a lot of ideas on and printables on their site from little postcards, to jokes, to notes that help steer your child to sleep at night or tidy their room. There are even little flags you can make. Honestly, I cannot praise them enough. The thought and effort that is put into every ounce of their products and ideas are outstanding. 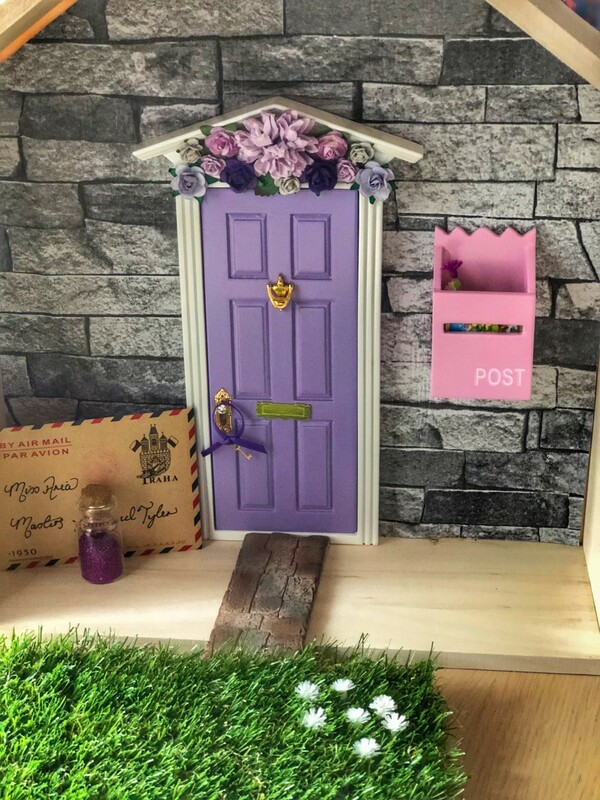 I am delighted to be able to giveaway a Purple Fairy door just like our to one of my lucky readers. Enter via the rafflecopter below and Good luck. Why not bring some magic into your house with The Fairy Trading Company. I cannot recommend them enough and cannot wait to bring lots of different scenes and adventures to life. Disclaimer:- I am an ambassador for The Fairy Trading Company, but I have bought accessory kits and love the company. They are supplying the door for the purpose of this competition. I like the Candy Pink Fairy Door, so pretty! I love the Pink Fairy Door with Flower Wall! It has to be purple for my daughters! 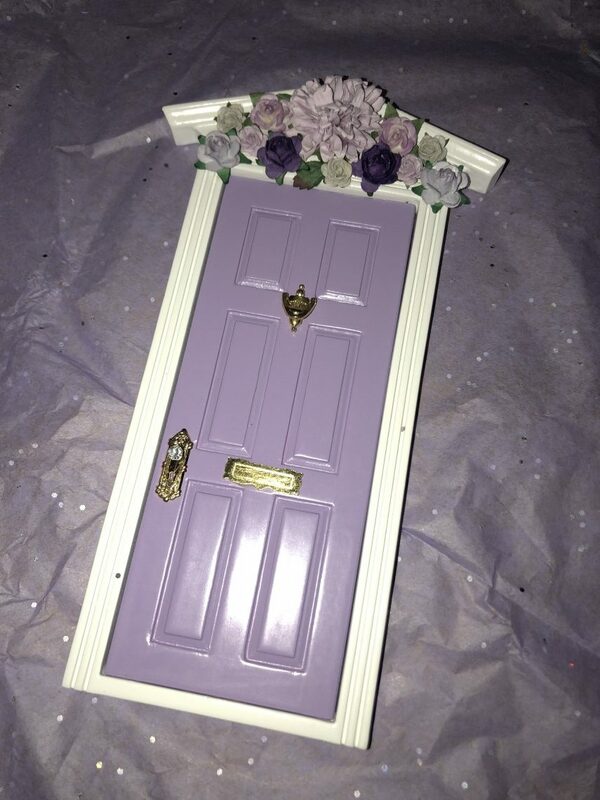 I like the stunning purple fairy door with flowers along the top of the door, the same as you chose. The tooth fairy door is so cute! Aww that is a good one. That one is a pretty one. The Candy Pink Fairy door is lovely! My favourite is the Lucky Leprechaun Fairy Door! I love the mermaid fairy door in the limited edition section! My daughter chose the Pink Fairy Door with Flower Wall. My daughter would absolutely love the Pink Fairy Door with Flower Wall. Red Fairy Door with Bunting. The Alice in Wonderland Fairy Door is beautiful! The purple one as it is my granddaughter’s favourite colour! I love the purple door! I love the Blue Magic Elf door with bunting. I really love the one that you have picked, The Purple Fairy Door with Flower Wall. It just looks amazing. We are moving soon so it would be a lovely way to make the new house magical. They are so cute! My favourite on the site is the Magical Mermaid fairy doors! It is a cute one.